The Dow is stacked with high-quality businesses, but some are stronger than others. These 4 blue chips are far more profitable than the other 26. The Dow Jones Industrial Average (DJINDICES:^DJI) consists of 30 of America's finest businesses. There's not a bad egg among them since last summer's makeover, and all 30 members are profitable right now. But even among heroes, some will be stronger than others. These are the four most profitable businesses on the Dow Jones today. With a trailing non-generally accepted accounting principles net income margin of 20.1%, Pfizer (NYSE:PFE) stands in fourth place -- more than 2 percentage point ahead of the next challenger. The medical giant works in a highly profitable field, where years of intensive drug and devices research turns into decades of high and stable profits. But Pfizer also plays this game better than almost anyone in the medical sector. With certified blockbusters like Viagra, Celebrex, and Lipitor under your belt, it's easy to defend sky-high margins. Walking up the profit ladder, you'll find Microsoft (NASDAQ:MSFT) next with a 20.9% net margin. The computing giant hasn't exactly rewarded shareholders over the last decade, but not for a lack of delivering profits. It's been a decade since Microsoft's trailing net margins last dipped below 20%, and sales more than doubled over the same span. Through macroeconomic disasters, Vista debacles, and the purported death of the PC, Microsoft's nearly robotic business heart takes a licking and keeps on ticking. 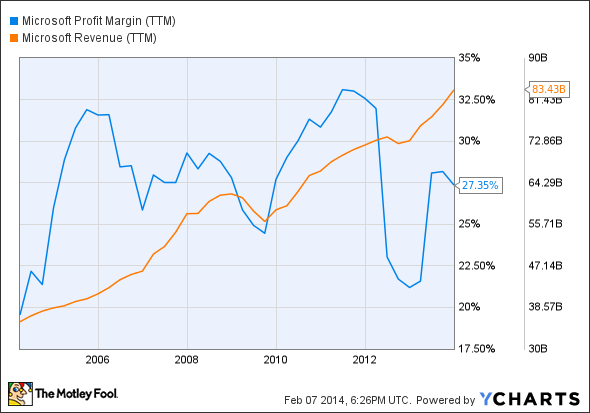 MSFT Profit Margin (TTM) data by YCharts. Next up, Goldman Sachs (NYSE:GS) ranks second with a 23.2% net margin. Goldman sets itself apart from other megabanks by leaning heavily on its investment banking division. You can think of Goldman as a massive hedge fund that just happens to run some traditional banking operations on the side. The company has both the experience and the massive scale to do it better than anyone else, and it shows in these huge income margins. Virtually unchallenged at the top, Visa (NYSE:V) sports a massive 39% income margin. Visa runs only one reportable business division, the eponymous Visa payment services. This global financial network took decades to plan and to build, but the hard work is mostly over. Now Visa can sit back and enjoy the rich margins that come with dominating a worldwide business with only a couple of serious rivals. To paraphrase Warren Buffett, Visa could be run by a ham sandwich nowadays. Sure, the company still works to develop the next big thing, but Visa is doing it from an unassailable platform of massive core profits. And that's why Visa boasts the widest net margins on the Dow Jones today.